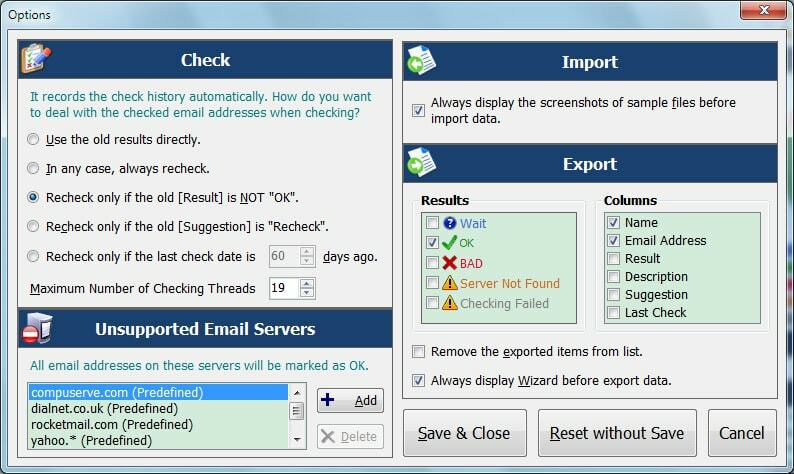 Email Checker Pro: check and verify email addresses are valid (format or syntax) and really existing on the corresponding email servers without sending in BATCH mode. Usually, it is used to maintain a clean emailing list. It works very fast, the more the faster due to use multi-threaded checking, it can check hundreds of email addresses per minute, depends on your computer performance and network speed. 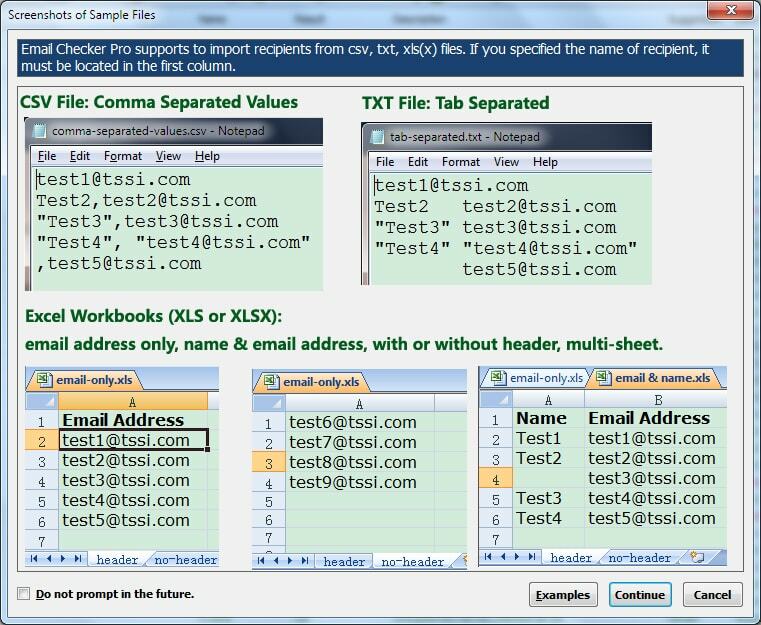 It's very easy to use: just import the email addresses from csv (comma separated values), txt (tab separated) or Excel Workbooks (.xls or xlsx), and then click <Check> button, the results will show soon. And you can also export the results to csv/txt/xls/xlxs files. Except displays the results in a list view traditionally, Email Checker Pro also makes the visual statistics by counts and 3D pie chart. The more visual is: the counts and 3D pie chart are updated in real time during checking email addresses. [Result]: OK, BAD, Wait, Server Not Found or Checking Failed. 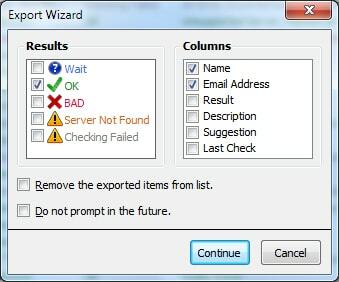 [Description] (reason of result): Really Exists (for OK), Invalid Email Address Format (for BAD), Indeed Nonexistent/Disabled/Unavailable/Discontinued (for BAD), Unsupported Server, Marked as OK (for OK), Invalid Email Server or Cannot Connect to It (for Server Not Found), An Error Occurred During Checking (for Checking Failed). [Suggestion]: Retain (for OK), Discard (for BAD) or Recheck (for Server Not Found and Checking Failed). [Last Check]: Email Checker Pro will save the last check date for every email address, and the check rule setting may rely on this date. [Interaction]: the interaction between Email Checker Pro and destination server during checking. If you do a lot of work that involves email addresses, you know how frustrating it is to send out an email blast, only to be met with multiple bounced messages! Each invalid email address represents lost time and effort on your part, but is there a quick way to find out if an address is valid, before you send anything out? Indeed there is, and it's today's discount software promotion, and it's called Email Checker Pro! Email Checker Pro lets you verify the validity of multiple email addresses in batch mode, without the need to send a single thing. 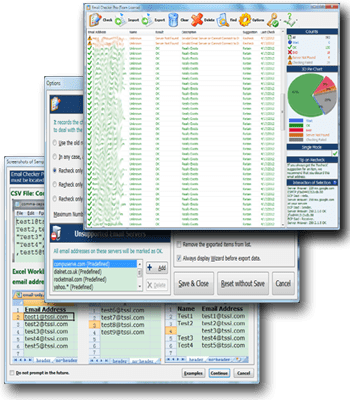 With Email Checker Pro, you can import and export huge lists of email addresses in CSV, TXT, and XLS format, then sit back as Email Checker Pro leverages the power of multithreading to validate anywhere from 500 to a whopping 1,000 addresses per minute! As the validation process proceeds, Email Checker Pro gives your eyes a visual treat by building, in real time, 3D pie charts and counts showing how many addresses are the real deal. Once the validation process is complete, Email Checker Pro gives you a rundown of how each email address checks out, including reasons why any particular email address comes back as invalid. The result? The cleanest email distribution list you've ever worked with, and a lot of saved time and effort! All this and more with a copy of Email Checker Pro! Email Checker Pro is a handy and reliable application designed to verify whether the specified email addresses exist. Email Checker Pro is able to process a list of email addresses in batch mode. All you need to do is import the list and press the 'Check' button. The 3D pie chart allows you to view the percentage of correct email addresses from the imported list. Email campaigns still remain one of the most efficient methods of marketing products and services, as well as staying in touch with existing customers. However, email lists are not constant - recipients come and go, change addresses and close their accounts all the time. This means that if you use newsletters as one of your marketing and sales channels and want to make sure that your messages go to valid and regularly used email addresses, you need a tool like Email Checker Pro! Email Checker Pro is an extremely fast and accurate tool capable of validating thousands of email addresses in the batch mode. The program makes sure that each address has a valid format and actually exists on the corresponding server. Thanks to the support of multi-threaded processing, the software can validate hundreds (up to 1000!) of addresses per minute, depending on the speed of the system and network bandwidth. Using the program is also a snap: all you need to start is to import addresses from a CSV file, a plain text file or an Excel workbook, and hit the Start button. The results will be shown in a table and a 3D pie chart for a more visual approach. Once the validation process is completed, you can export the results to a new file, skipping bad or suspicious addresses. Email Checker Pro is an invaluable tool for any online marketer or a company that uses email blasts to reach its current or prospective customers. Fast, easy-to-use and ultimately reliable, it will make sure that valuable information is sent only to active and valid email addresses and that the corporate mailing list remains clean at all times! Supports to customize the maximum number of checking threads, and changed the default value from 50 to 19. Adds a new unsupported email server - dfds.dk. Increased the update frequency for the statistics and 3D pie chart. Optimized the import algorithm for Excel files. Cannot export to the Excel file if the target file is in use. If minimized the normal window, and activate it from the taskbar, the window size will be changed (referring the last size). If the [Name] field (first field) has empty cell(s) in Excel documents, when import data from them will cause the dislocation values. Adds new check rule: recheck old email addresses only if the old [Suggestion] is "Recheck". The Del key cannot work in the Single Mode input box. Cannot completely display the number of # days ago rule if the number is more than 99. Adds new check rule: "Recheck only if the last check date is # days ago". Adds new predefined unsupported email server - ymail.com. Supports removing the exported items from list. Updates the statistics (counts & 3D pie chart) real-time during checking. Improved Excel documents import/export algorithm to get efficient behavior. Provides 3D pie chart statistics. Provides the sample files and their screenshots. Provides the unsupported email servers. Importing data slowly if a column was sorted. Provides the icon for each result. I'm using Email Checker Pro, it can quickly check and verify whether the email addresses are valid (format or syntax) and really existing on the corresponding email servers without sending in batch mode. Usually, I use it to maintain a clean emailing list. Windows XP/2003/Vista/7/8 or higher, 32 & 64-bit both.